Private collection, Paris; sale, Hôtel Drouot, Paris, March 16-7, 1931, lots 37 (Cache-Cache) and 38 (Musicienne). Baronne Cassel van Doorn (her wax seal is on the reverse of each panel); sale, Galerie Charpentier, Paris, May 30, 1956, lots 34 (Musicienne) and 35 (Cache-Cache). S. Wells-Robertson, Marguerite Gerard: 1761-1837, unpublished doctoral dissertation, New York University, 1978, I, pp. 158, 168, pl. 105 'The Music Lesson'. Despite the comparatively large number of surviving paintings by Garnier, most of which - like the present pair - are signed and dated, there has been no serious study of the artist, and his biography remains obscure. He was a pupil of the history painter and premier peintre du roi, Jean-Baptiste-Marie Pierre, and exhibited with some frequency at the official Paris Salons from 1793 to 1814. An occasional portraitist and still life painter who enjoyed the protection of the Duc de Charteres (the future Philippe-Egalité), Garnier was principally a painter of small-scale domestic genre scenes in le goût hollandais - a fashionable style at the end of the Ancien Regime which imitated the fine finish of the 17th century Dutch 'fijnschilders'. It was a taste he shared with his compatriots, Marguerite Gerard and Louis-Leopold Boilly, although Garnier's palette tended to be more decorative and his mood more cheerful; certainly Boilly's inclination to tart social satire was quite alien to Garnier's sunny artistic personality. As with most of Garnier's paintings, the present pair are keenly observed illustrations of the costumes, furnishing and manners of fashionable society on the eve of the Revolution. 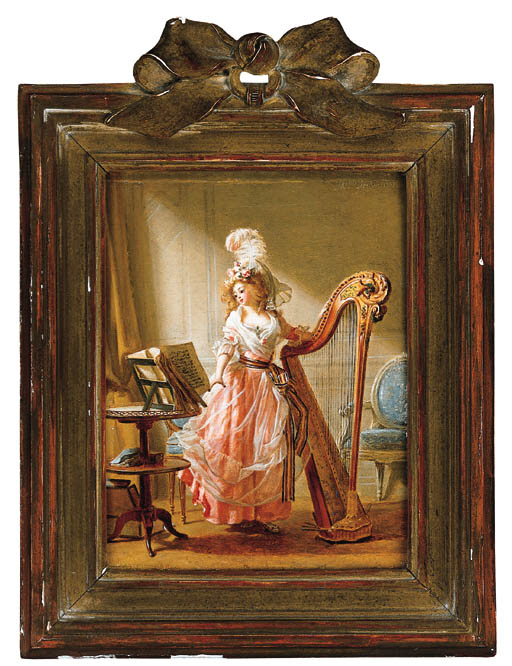 In La Jeune Musicienne, a pretty girl wearing a stylishly plumed coiffure and silk gauze fichu flips through a musical manuscript as she prepares to play the harp. Proficiency in playing an instrument was one of the skills required of an educated lady in 18th century France and was intended to provide a decorous diversion for both the hostess and her guests. The young woman who peers around the door in Le Jeu de Cache-Cache is playing hide-and-seek with a small child in the next room. Surrounded as she is by a doll, a fan and a toy pony, Garnier's infantalized heroine reveals more about the status of well-bred women in French society near the end of the century than the artist may have intended. In both paintings Garnier's accuracy in reporting the precise appearance of Louis XVI chairs, a brass-fitted circular table, and pale wood-panelled walls is prodigious, and his mastery of shimmering silk demonstrates his finest 'Metsu Manner'. Garnier regularly recycled successful compositions, and a larger (18 ½ x 15¼in.) version of Le Jeu de Cache-Cache, also signed and dated 1789, was sold at Sotheby's, London, April 5, 1995, lot 189 (£68,000 = $108,000). In it, the toys are gone and the toddler has been replaced by a pair of trysting lovers; her pose unchanged, the young woman there appears to be spying rather than hiding.